These are photos taken in July 1997 by C.W.Hoffsommer of Iowa. 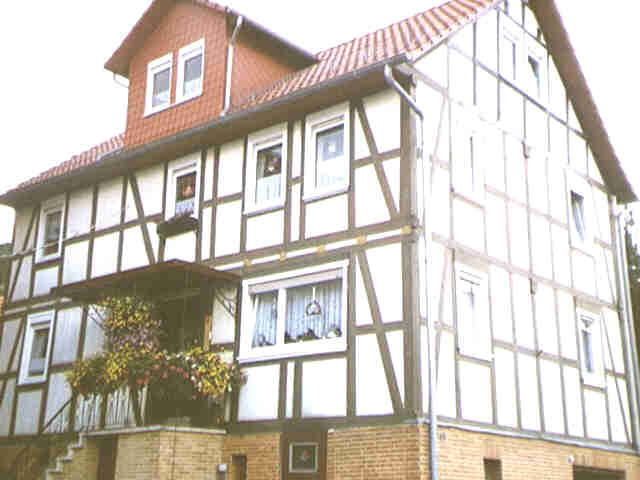 They are of Mitterode, Hesse-Cassel, Germany. They have been "thumbnailed" on this page to facilitate downloading. Please click on the photo for a larger .gif image. Click here for CW's description of his travels. This first photo shows approximately half the town nestled at the top of the "cleared forest" where the town was built over 800 years ago. The Hofsommers settled here around 1750, and started leaving for America around 1847. The sign below welcomes you, strangely enough, to Mitterode. Below is Adam Ackerman's home. This is the church the Hofsommers' attended. 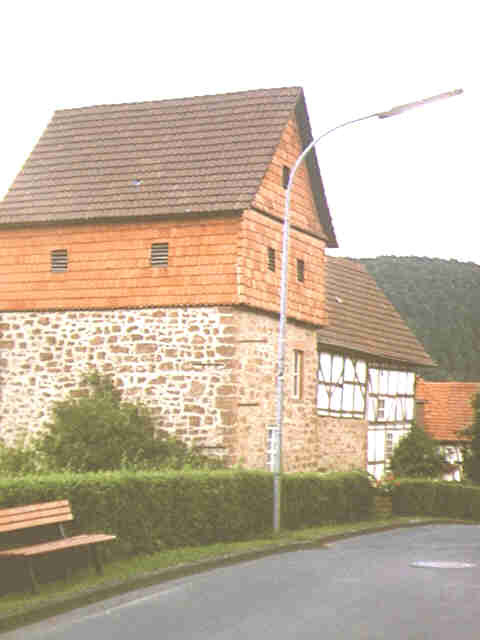 Pfarrkirche St. Nikolaus. built around 1500 on top of a medieval tower. 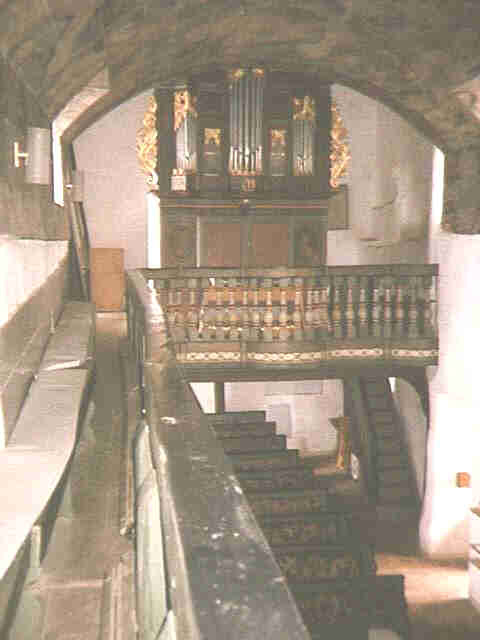 The remaining photos are of the interior of the church. This is the story of one Hoffsommer's travels to the village from whence the family nach Amerika ausgewandert. Conrad by name, #160 7-63 by John George, 1.0324 by Bruce Alfred. The visit came at the end of my first trip to Europe and I felt it began when I got on the train at Frankfurt am Main headed northeast. One must change trains at Fulda and Bebra before getting off at Sontra, which is closest you can get to Mitterode by rail. I didn't get to Mitterode directly, but stopped off in Bad Hersfeld to locate the hotel I would be staying in that night. After a walk around B H I hopped back on the train and went on to Sontra and located the hotel I hoped to be in the next night. I had never gotten a fax confirming my reservation in Sontra and needed to know if I needed to stay in Bad Hersfeld a second night. As I rode along from Frankfurt to Sontra I watched the scenery look more and more like eastern Pennsylvania around Reading. It finally dawned on me that the Hofsommers, and all the other emigrants only changed location. 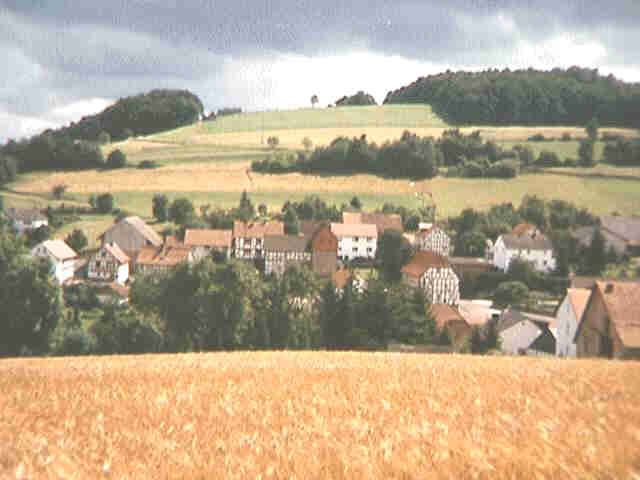 The topography is the same, the vegetation was the same, and even, by and large, was the language as they joined in German communities in the US. The only thing which was markedly different was the architecture. By quarter after one I had found out I had a place to stay the next night, so I set off for Mitterode. The hotel was on the same side of the tracks as Mitterode, so I started walking in that direction. After going about a half mile past the train station (and an underpass) I realized that the road I was on didn't continue along the tracks. Doubling back I spied a small tunnel under the tracks. It wasn't high enough to stand up straight in, but I saw light on the other side so I went in. Fortunately, I came out on the other side at the end of a farm lane which got me out to the right road. Finally on the right road, I must admit that I was getting a little excited when I finally saw the sign saying "Mitterode 3km". I knew the road didn't go anywhere else, so I couldn't miss it if I tried. At about 2:30 I rounded the last curve and saw the village for the first time. Before I left I had tried to imagine what the place would look like. Looking on the map, and seeing the line snaking up to a hook at the end, I imagined that I would be walking up a narrow road which ended in a tiny village surrounded by hills. The only flaw in my imagination was that the road was actually on the right side of the valley, not the left. I'm glad I had the opportunity to walk into and out of Mitterode as it gave me the proper perspective of what it could have been like 150 years ago. The road is paved, and there is a power transmission line tromping across the hills, but got to see the land at the pace they knew then. The next day when I drove a rental car it seemed like I got there before I left rather than the hour and a quarter it took me to walk the 7 or 8 km back to Sontra. Back to Bad Hersfeld for the night, and woke up to heavy rain wondering if it would clear by noon. It was at least dry from the top for my walk to the train station, but just knew the rain wasn't over. Arriving and checking in at the hotel in Sontra by 1000, I was severely doubting the weather already so I had them arrange a rental for me. As the car wouldn't get there until noon, I took the opportunity to walk around Sontra. 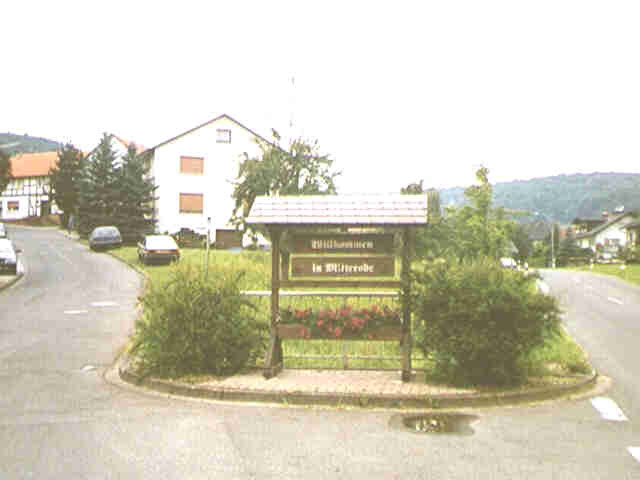 It is now, and I'm sure was then, the central market town for the district comprising Mitterode and about a dozen other tiny villages. The cobblestone streets I found and the Rathaus square didn't look like they could have changed much since 1856. I finally got to Mitterode about 1PM, parked the car and proceed to try to find house numbers which were mentioned in the Ackerman listings. One of the first houses I came across which had one of the correct numbers didn't look right - It couldn't possibly be old enough to have been lived in by Hofsommers prior to the diaspora. Fortunately, being Saturday, there were people at home there, indeed they were piling out of the house and getting into their car. They were a young couple who hadn't lived there too long, so couldn't tell me much history other than the fact that the houses had been renumbered a number of years back. (actually about 1972) They did, however, tell me that some old people lived over yonder (not their phrase, but certainly their gestures) who might be able to help me. I drove yonder and saw an older couple and another woman talking by the couple's front fence. I parked the car and asked if anyone spoke English. The man said he knew a little. I introduced myself (in German), explaining that my family had emigrated from there in 1856, and I was there trying to take pictures of the houses where they had lived. I them asked him if he knew Adam Ackerman who had written the village history and was the source of the information I had. "Ja, I know him", he said with a twinkle in his eye. "That's you, isn't it?" I said. For the next three hours, I was talking to the one person best qualified to tell me the town history. Would that I spoke German! It soon became obvious that my phrase book was entirely useless. Note to myself: next time carry your bilingual dictionary! Be that as it may, Herr Ackerman invited me into his home where he showed me not only the history book, but we leaved through the looseleaf notes, clippings and pictures he'd compiled while writing it. I tried to note what the new house numbers were for the "ancestral homes", but after I got home I noticed I had written down two new numbers for M.H.8. Birth and death location of Johann Adam, son of Ecard. Depending on which one is correct, Adam Ackerman could be living in it, and I did take a picture. Leaving his house, we went 50m down and across the street to the church. We got the key from a neighbor and went in. Pfarrkirche Sint Nikolas was built in stages, apparently. 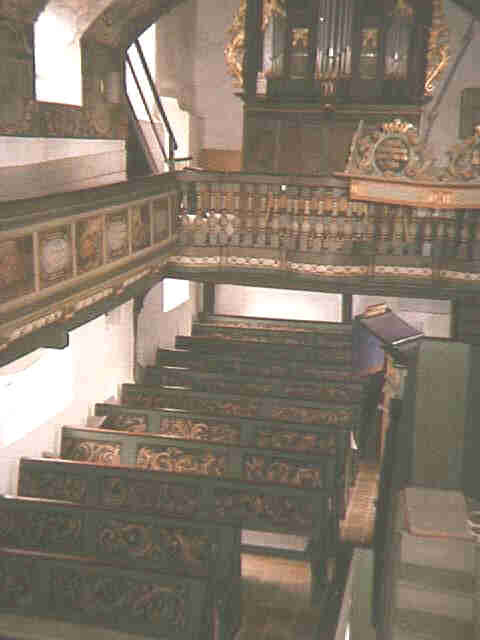 The current building configuration dates from 1500, when it was enlarged from the original 1200 edifice, which was in turn built upon and used some walls and foundation from a medieval tower - of unknown date. 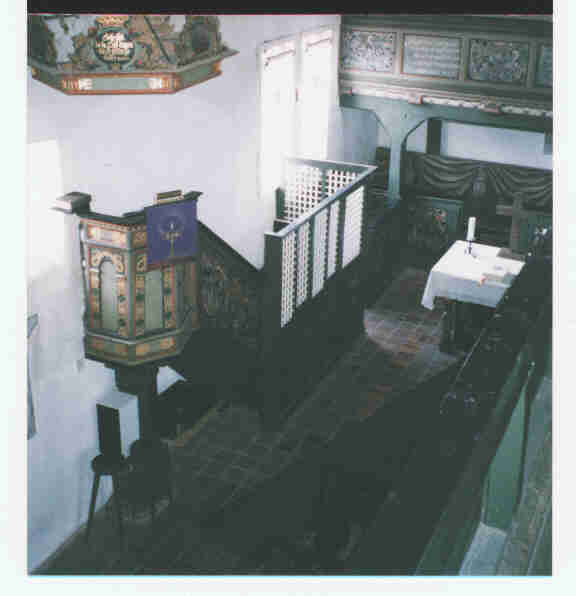 With the exception of some unobtrusive electric lights and the removal of foot powered organ bellows, the church probably doesn't look much different than when the organ was installed in 1728, and Ecard was Burgermeister in the mid 1700's. Leaving the interior of the church, Adam explained that the old cemetery had been right next to the building, but there are now no old stones and the area is grassed over. We walked on down through the village, and he pointed out where some of the old homes had been, but long since been turned back into pasture or cropland. We suddenly turned off the road and headed across a field and straight up the hill to behind the new cemetery, then further up to where we could see the entire town from a wheatfield. As we were there I kept pointing up to the sky, especially when we heard thunder. I suggested we seek cover soon, but if you've ever asked a historian about history you know how difficult it is to change the subject. When the rain did start (about two minutes after I took the wheatfield shot), we did get down to stand in the garage doorway of the closest house. We were in that doorway for at least a half hour. During that time Ackerman told me about his WWII experiences. (He is 83 now and could climb those hills almost as well as I could.) He apparently was captured and spent time in a POW camp in England. He still seemed amazed at the good treatment he received there, both during his stay, and on his return home. The hardest thing he found was the fact that he wasn't allowed to send or receive any letters from home. The rain finally let up and we returned to his home and continued to misunderstand each other a little longer, before I left to drive "around the block". Back through Sontra and over the hill to Stadhosbach and Kirchhosbach, but the weather was conspiring against me again and I didn't get out and just amble about. The rain which hit as I was leaving Kirchhosbach was too hard for even high speed wipers. I regret that I didn't have my number one camera with me, and only had a couple of days in the area, but what's the future for, anyway?